2 year terms have been voted on for the following CONECA members. Ken Potter, hereby move that I, Ken Potter be authorized to have 2016 Lincoln Cents struck into a (dated 1982-84) Mexican 50 Pesos coins (brockaged with the Lincoln head and date face down) with our CONECA logo die. The mintage will be limited to 300 with 200 struck to start and a balance of 100 more struck later within the year 2016 if needed. Our die will be mated with a reverse die of suitable design supplied by the Mint at the discretion of Ken Potter. Jon Sullivan will handle distribution. James Motley, will set up a special PayPal page so collectors can order in such a manner if they prefer. Buyers may also pay John Sullivan by cash, check or money order; checks and money orders made out payable to CONECA. The price of the medals will be set at $14.50 each postpaid for one to four medals, $50 postpaid for five medals, $90 for 10 medals and $9 each for any quantify over 10 postpaid. 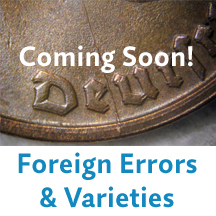 Profits from the sales are designated for the Young Numismatist Fund and may be used for any educational or other venture(s) that Jon Sullivan (or others) bring to the CONECA Board and is approved that are related to our YN program. This may be books for distribution to CONECA YNs, the purchase of coins to be used as incentives to get YNs to write articles or otherwise serve CONECA, donations to the American Numismatic Association (ANA) to send a YN to the ANA Summer Seminar or anything else the CONECA board approves. 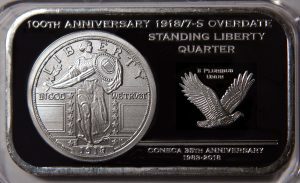 Ken Potter will be supplied with $650 seed money by the CONECA Treasurer to get project paid for which will cover the cost of the Mexican 50 pesos coins at 20c, each, the Lincoln cents required, cost of flips, cost of striking, postage and other incidentals for the first 200 pieces. Additional funds will be supplied at a later date for the final 100 pieces to be struck if needed. Any overage in funds will be returned to the treasurer by Ken Potter. 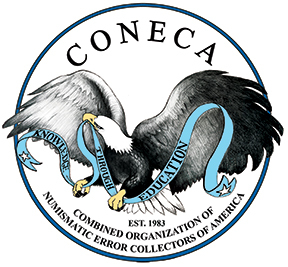 I make a motion for Ken to design and produce the flat bars for CONECA using the CONECA logo. These will be sold to raise funds for CONECA. Motion to open up the annual BOG (2016) meeting. Marks opens the meeting by looking at Jeff’s (Editor’s Seat 2) report. It is noted that Jeff is stepping down at the end of his term and that E/S received a 3rd place award from the ANA. To accept [Jeff’s] report as written and move forward. I, Rick Emery, motion to accept Joseph A. Ceravone’s (Recognitions / Historian Seat 7) report. I make a motion to accept Jason’s [Secretary report] report as is. I have read the report and it sounds good to me. I make a motion to accept Peter’s [Seat 5 Webmaster] report as is. I make a motion that we vote on bringing Allan [Anderson] on board as the editor for CONECA [ErrorScope] working under Seat #2 Publications as the Editor. … I would make a motion to vote on keeping the dues at the current levels and to send comp issues to Coinworld, Numismatic News, the sitting ANA President, the CONECA Library and the ANA Library. I Jim Motley make the following motion to change the price on a Family membership from $12.50 to $37.50, that would include one full adult membership with an Errorscope mailed out and one additional member within the same household with no Errorscopes. Each additional Family membership for each additional person in the same household that want to be a member is an additional $12.50.